Online betting in the elite world of horse racing, as captured in classic movies like My Fair Lady, hasn’t been done in by the modern world. Like other gambling venues, though, horse racing has had to evolve with the times. With the availability of virtual gambling only increasing, many bettors are moving their money online. There are no waiting lines and the method of money transfer is safer than carrying piles of cash to or from a horse track or betting center. Many newbies and veterans are looking for the best online casino and pulling out all the stops in order to find it. U.S. horse racing is big business for the state of California. According to a press release from Cantor Gaming, horse racing employs 50,000 California residents and generates $2.5 billion dollars for the state each year. If the rising tide of online betting wiped out the horse betting in California, the results would be catastrophic to the job market and the local economy. California and the state’s non-profit horse racing organization, Horse Racing United, recognized the threat that online gaming posed to one of the state’s top industries early on. For more than a decade, California has permitted interstate online betting on horses to ensure that the horse racing and betting business of California doesn't lose out to the easily accessible betting online. In an effort to further support the horse racing industry of California, the state is considering the legalization of interstate online poker, which will be run by Horse Racing United. After a decade, California’s gaming industry has confirmed the substantial profits that come from online gambling. The biggest potential benefit to the world of horse racing by the spread of online betting is the increase in participants. No longer do bettors have to live near enough to a horse track or off-track betting (OTB) center, or be dedicated enough to the sport to make a long drive to the venue. Betting on a horse is as simple as choosing the best online casino, logging in, funding your account, and picking your winners. The number of tracks built for horse racing is limited in the United States - several states have only one designated track, while many others don’t have any. Online betting makes it so that those who want to bet on horses can do so without having to get to a track. As the world of horse racing and betting transitions online, the sport has unprecedented opportunity for growth. 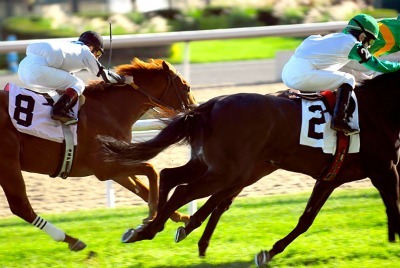 Not only does an online presence give more people access to horse betting, but the socialization of the Internet makes it a prime place for rapid marketing. The best online casino recognizes that, if online horse betting becomes a fun way for Internet-users to spend their time, satisfied users are likely to spread the word through social networks, increasing exposure and profits. Few things matter in the gambling world as much as reputation. That’s why some casinos have begun using incentives to encourage customers to help promote them online. Offering free game play to customers who share a message about the casino on a social networking site ensures exposure to potential new customers, getting casino owners a reasonable return on investment. Online horse betting may never be as profitable as more familiar gambling games, like poker or blackjack. As the world of horse racing continues its online growth, though, the sport is likely to rise in familiarity, popularity and profit. In an effort to further support the horse racing industry of California, the state is considering the legalization of interstate online poker, which will be run by " target="_blank">Horse Racing United. After a decade, California’s gaming industry has confirmed the substantial profits that come from online gambling. Few things matter in the gambling world as much as reputation. That’s why some casinos have begun to encourage customers to help promote them online. Offering free game play to customers who share a message about the casino on a social networking site ensures exposure to potential new customers, getting casino owners a reasonable return on investment.